Relatively tiny fuzzy animals? They can climb HIGH. Remember the raccoon that traveled partway up the facade of a 25-story building? High. 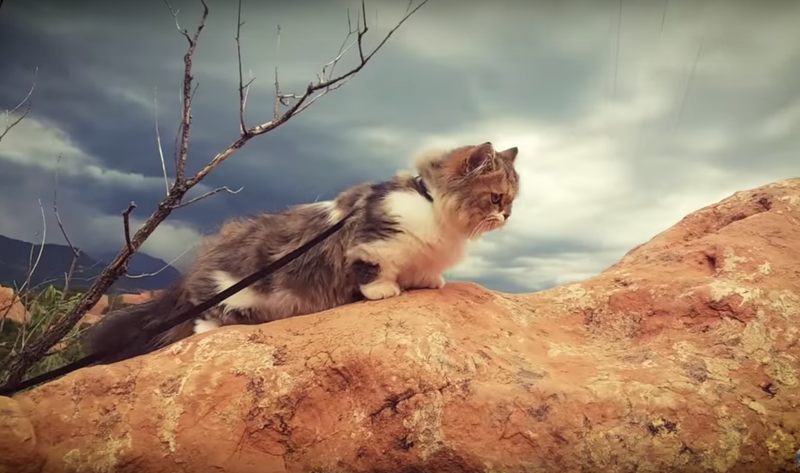 If you liked that, then this might also be relevant to your interests: videos of cats hiking. I somewhat bemusedly just watched 15 minutes of cats climbing in the great outdoors and can confirm it’s like The Clouds of Sils Maria but with a person who is probably wearing a poncho and an impeccably groomed cat. I’m also getting strong Lion King vibes of course, except the cat alway being on a leash tends to spoil that particular mood. Some of the videos feature music. Others just the sounds of nature. A few of these videos were published last year, but Mashable posted about them today: Someone wants these peregrinating felines to be a thing. But whether it’s trendy or not, these videos are here for you to enjoy and fall asleep to. Rest up because tomorrow we will all be gripped with the irresistible urge to move to Arizona and join a new age cult where we have no intention of doing any hiking whatsoever.